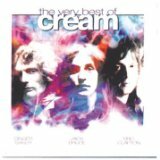 Wheels Of Fire (1968), Fresh Cream (1966), The Very Best Of Cream (this album) (compilation) (1995), Heavy Cream (compilation) (1972), Strange Brew: The Very Best Of Cream (compilation) (1983), Royal Albert Hall: London May 2-3-5-6 2005 (2005), Those Were The Days (compilation) (1997), Best Of Cream (compilation) (1969). Showing latest 5 ratings for this track. | Show all 7 ratings for this track.